Decorating small or tight spaces can be challenging. We have some easy tips that will help you decorate, whilst making the space feel larger! Whites and other light colors are the best way to keep a smaller space light and bright. Darker colors have the tendency to box a space in and feel closed in. Light colors make any space feel more open and airy. When choosing a paint color, select a white or light colored neutral for the walls. The floors should be lighter as well. 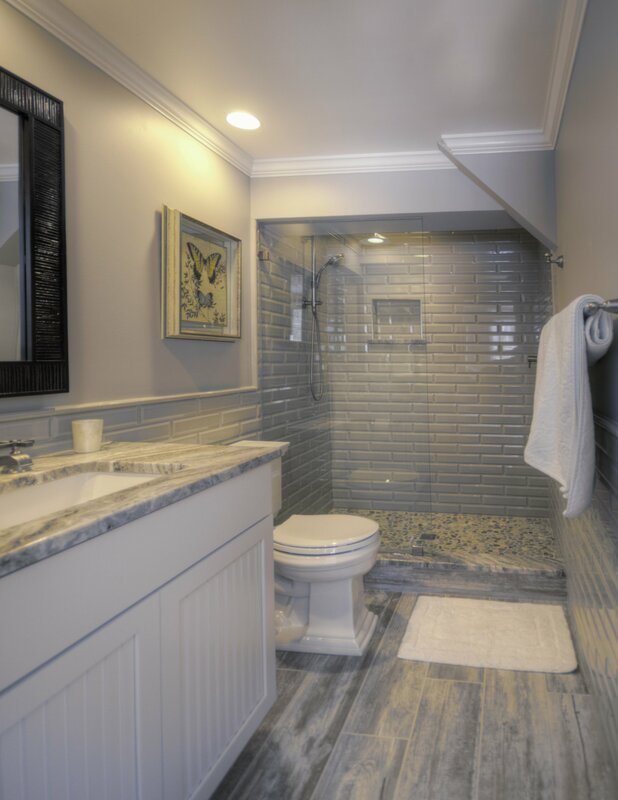 We like using light colored tile, natural stone or wood look tile with a white wash stain. Stay away from using small tile in a small space. Small scale tile or narrow planks tend to look busy in a small area. Choose larger tile or wide planked wood look tile. This particular trick will enhance the feeling of having more square footage. If the bathroom is the room in question, a level entry shower in here will give the perception that the room is 20% – 30% larger that a bathroom with a traditional curb into the shower. Using this idea in conjunction with large format, light colored tile will optimize your space and give the room a much more airy feeling. Light is key when decorating a small space. Natural light works best for creating a bright and open area. If natural light is scarce, make sure to add plenty of overhead lighting as well as having adequate accent and task lighting. Floor lamps are a great choice for smaller rooms. They can be tucked away behind furniture or placed in a corner. They provide ample light and are true space savers. Darker rooms feel smaller than they really are. Light and bright rooms feel larger. This is a key factor to remember when decorating a small area. Upholstery should also be selected on a light color scale. To add interest layer different fabrics and textures. When the time comes to decorate and accessorize, choose a few pops of color to disperse into the space. We suggest adding color to the room through the use of accent pillows, books and art work. Add some greenery as well to give the space life. Mirrors work wonders in small areas. They reflect light and space, making the room feel brighter and more spacious. If there are not many windows to let in natural light, consider hanging a large mirror adjacent to a wall with windows. The space will appear to have double the amount of windows than what is really there. Skip the heavy drapery in this application. For window coverings, choose attractive blinds or hang window sheers. Let the light in to help the space feel larger. Draw the eye up by implementing the use of vertical lines. This can be done by painting an accent wall with vertical stripes, or by installing an attractive wall paper with vertical stripes. The stripes do not need to be bold. Select a light color that provides a small amount of contrast to the wall color! Plan ahead and cover all your basis in this read. Your small area will become a useable space that is functional and enjoyable!